George Baldock was subject to a ‘very big bid’ from a Championship club during the transfer window, but insists he only has eyes for MK Dons. The 23-year-old has been Karl Robinson’s first choice right back since his loan-deal with Oxford United was cut short in January, establishing himself ahead of both Jordan Spence and Lee Hodson while Dons were in the Championship. Despite suffering relegation, Baldock drew interest from a Championship club and could have made the move back into the second tier. 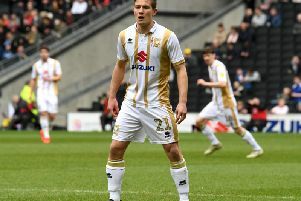 After speaking with his manager, Baldock said he felt it was right to remain at Stadium MK, insisting winning promotion with his boyhood club was the main priority this season. “I just focussed on being here,” said Baldock. “It’s not the first time it has happened, and I saw it happen with my brother. But you just keep your head down and get on with your football. I love it here. Robinson said he was impressed with Baldock’s maturity during the interest late in the window, which had echoes of his brother Sam’s move to West Ham back in 2011. He said: “He’s a very strong character and he’s MK Dons through and through. We turned down a very big bid for him. He spoke to me and felt this was his job in hand this season. He is someone who will go. Francis Jeffers told me he thought he should be playing in the Premier League. Baldock continued: “I’m not one to kick down doors and kick up a fuss to leave because I’m happy here. If you think about it too much, it’ll affect your game in a negative way. You’ve got to be mature about it.